Pay for 3 - Stay for 4 - Pay for 6 - Stay for 8. For every three paid nights, enjoy one night absolutely free! 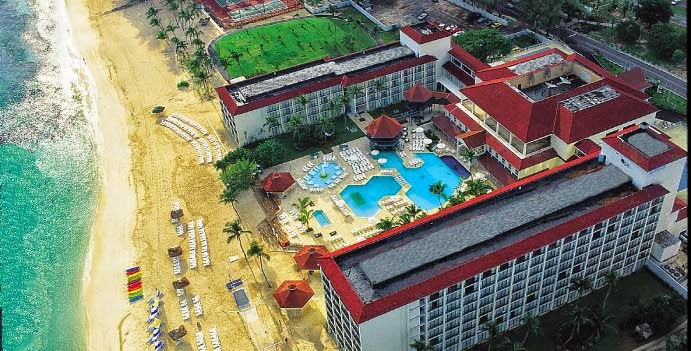 4-Night Stays start at just $645 per person. 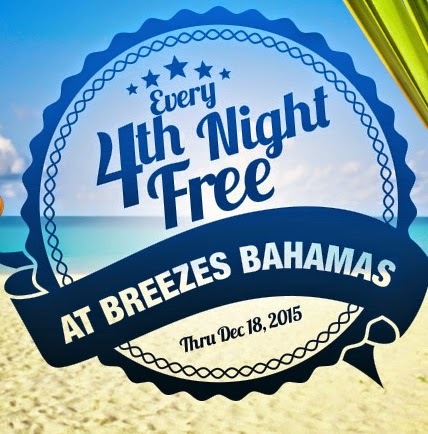 Breezes Bahamas is located on beautiful Cable Beach - the island’s best! 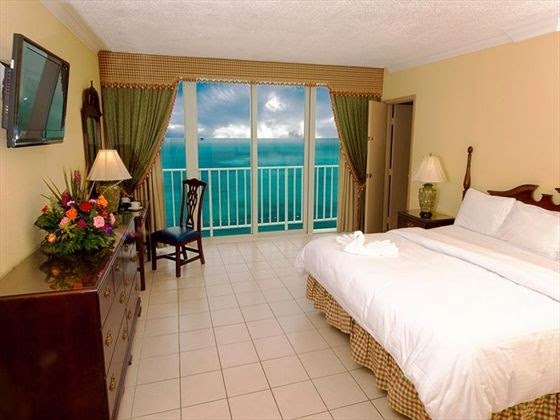 Breezes Bahamas seaside resort has 391 casually elegant guest rooms with lush island or ocean views. New for 2015, Deluxe Beach Front rooms located directed on the beach. All rooms include WiFi, satellite TV, direct-dial telephones, CD players, iron & ironing board, hair dryers and in-room safety deposit boxes. Each room features either one king size or two double beds. A “Breezeway” is available for guests in our Garden facing rooms – for easy access to the beach. Variety of settings and cuisines including Italian, Asian-fusion, Continental, local cuisine, grilled favorites, signature a la carte indoor and outdoor dining, along with lavish buffets. 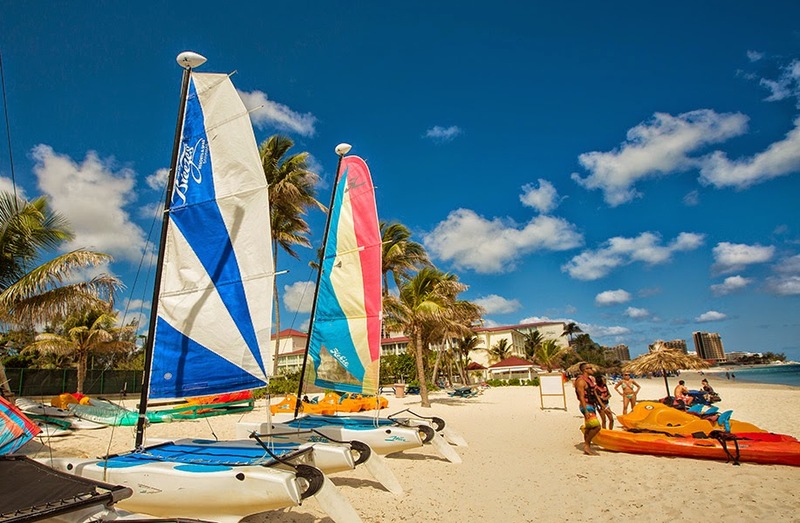 Endless list of things to do on land and offshore - windsurfing, sailing, kayaking, tennis (3 lighted courts with free instruction), basketball, volleyball, rock climbing, flying trapeze and more! Beach Cabana Rentals with cocktail service • Munasan (Asian-fusion) restaurant • Reggae Cafe, outdoor dining option • Guest Concierge Service • New Deluxe Beach Front room category with direct beach access and beach cabana with cocktail service. These rooms won't last long at these prices! Rates listed are per person, per stay based on double occupancy, and valid on new bookings only. $645 advertised rate is per person, based on a 4-night stay in a Deluxe Garden View room between Aug 8 - Nov 6. Rates vary based on travel period. 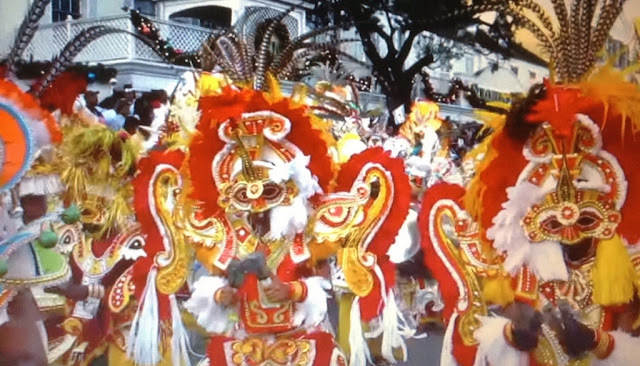 4-night stays start at $774 now through Aug 7 and $710 from Nov 7 - Dec 18. Weekend surcharge of $12 per person, per night applies to Thursday, Friday & Saturday night stays ($24 per night based on double) not included in advertised rates. All guests must be 14 or older. Single occupancy rate = 150% of the per person, per night double rate. Cannot be combined with any other offer or promotion. Not applicable for group bookings. Transfers are not included.